The first few years of a child’s education are vitally important as they provide the academic foundations. We have high expectations of our girls and are proud of each and every one of them. 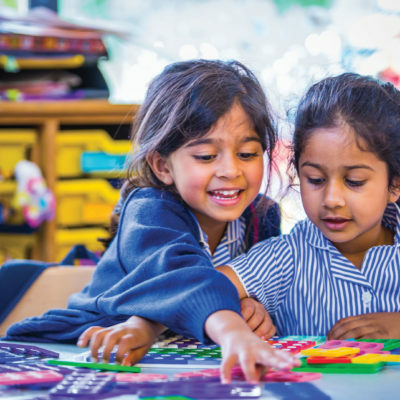 Whilst the curriculum is structured with an emphasis on reading and writing, the focus in Bluebelles is on learning through play. Our objective is to enable the girls to develop their literacy and numeracy abilities so that they are well prepared for Junior School. We work hard to develop the girls’ language and communication proficiency, creative ability and social and emotional skills. By the end of the Reception Year our aim is for each child to read fluently and enjoy books, to be writing on her own, making phonetic attempts at spelling and incorporating tricky words in to her writing. The girls enjoy weekly Music, Ballet, PE and Swimming lessons and a wealth of opportunities and practical experiences to further develop each child’s understanding of the world around her, both in school and during exciting day trips. Thank you to all my daughter’s teachers for doing an amazing job.